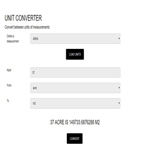 Unit Converter includes 23 measurements units with 200 unit conversion. 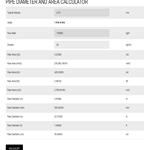 You can calculate the diameter of any pipe using this calculator. 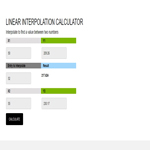 The calculator supports two units of measurements, SI Units and English/US Units. + Flow rate - This can be defined by selecting either Mass Flow or Volumetric Flow basis. The application has a predefined list of services the includes typical velocities that can be used for the velocity input, the purpose of this is to provide a quick estimate, you can also use your own defined velocity input if you prefer. 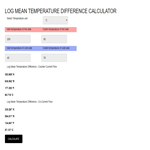 The Log Mean Temperature Difference (LMTD) for Counter current flow and Co-current flow also called (Parallel flow) can be calculated using this calculator. The input can be specified in three units Celsius, Kelvin or Fahrenheit.